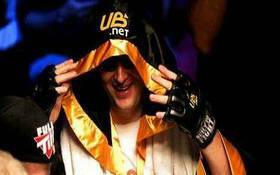 Phil Hellmuth’s entrance –typically a couple hours late– is turning out to be a cringe-worthy moment every year at the World Series of Poker, and it was no different in 2010 as the 11-time WSOP bracelet winner showed up wearing a long satin fighter’s robe with the UB logo prominently displayed, along with MMA gloves. His entourage this time around included the usual scantily clad women, but also the voice of the UFC Bruce Buffer, who contributed to the spectacle by announcing Hellmuth’s arrival. In the past Hellmuth has arrived dressed as a racecar driver –where he famously crashed the car the day before and also as Julius Caesar and Gen. George Patton. This entry was posted on Thursday, July 8th, 2010 at 10:47 am and is filed under Poker News. You can follow any responses to this entry through the RSS 2.0 feed. You can leave a response, or trackback from your own site.